I’ve been told the adoption process isn’t easy. We’re just starting to dive in, and I’m already finding this true. 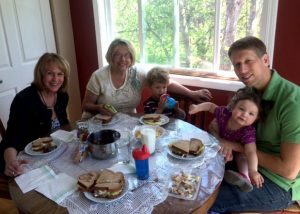 The last couple weeks have been a little bit wild, as we found out that our adoption agency’s branch in Madison is closing down. Although we should still be able to adopt through their Illinois headquarters, this news still has stirred up much grief, confusion, and waiting on our part (and on others as well). Our agency has been great at keeping in touch and trying to set us up with the proper resources, but we are still waiting. Right now we’re basically waiting on approval from South Korea, waiting on word from our agency, and waiting to get set up with a new case worker for our home-study. On the good side, we do have a peace about things. However, I have to admit that some days my patience is better than others. Please continue to keep these things in your prayers. I know it’s worth it, but know it will be quite the journey. Thanks! What this does mean is that the main person that we have been working with (and absolutely LOVE) will most likely not be finishing up our home study and such. 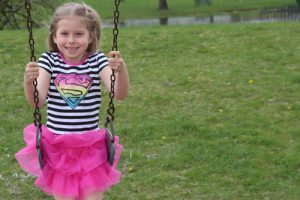 We are working with her to figure out next steps- whether we could move forward faster and have her finish our paperwork or have another agent complete it. All that said, please pray for our social worker along with all those affected by this decision. She has helped many many families over the years. Please ask that God would help this transition go smoothly, and help us to know what the next steps are. We would love to still be able to work with her to finish our home study, but are leaving that in God’s hands. Coming back to this adoption journey…No, the waves aren’t crashing down, but I’ve gotta say that even with the uncertainties, there’s a peace that God is in control. Talked with our agency today. Still waiting to hear back from South Korea on a few things. 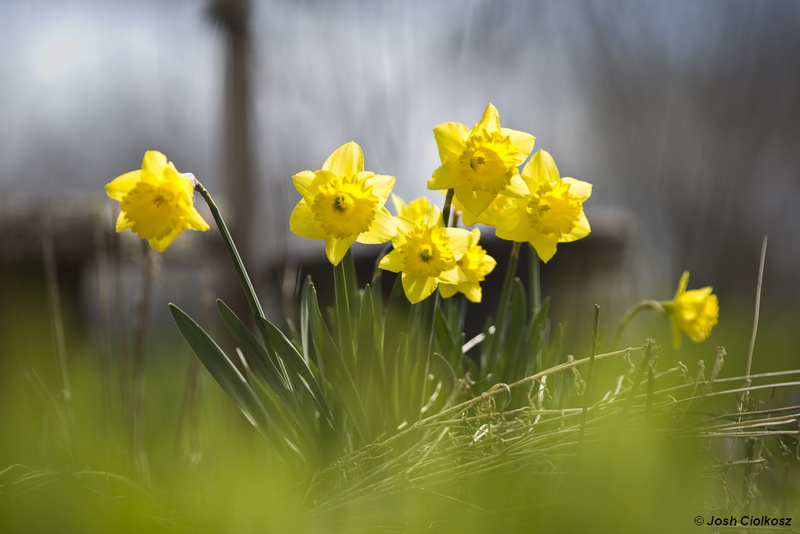 You can pray for patience, approvals, and a smooth transition to a new caseworker. Thanks! Lifelink International Adoption will continue to operate and provide services throughout Illinois, but effective July 1st our Iowa and Wisconsin offices will be closing. Lifelink International Adoption’s current Iowa and Wisconsin clients have been provided with the appropriate resources for moving forward. We will not be accepting new clients from these states. 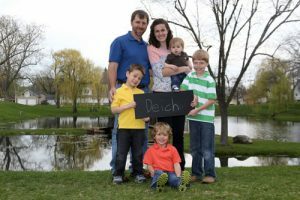 This decision was difficult for Lifelink International Adoption and its parent corporation Lutheran Child and Family Services of Illinois (LCFS), but became necessary based on the current international-adoption landscape. If you are following along with us in this puzzle fundraiser, I’m excited to announce that we have reached the halfway point!! Yay! Last night when I went to bed we were literally one piece away, and this morning I woke up to six more. Thank you. Thanks for being a part of this with us, and stay tuned! Just a week and a half in, and we’ve been so encouraged by the gifts, sweet notes, and outpouring of love from this puzzle fundraiser. Honestly, this has been a blessing to our souls. Since returning back from overseas, at times we have struggled with feeling lonely/disconnected, but ever since starting this, it has been so so good to be reminded that we have really incredible friends and family all over the world. It’s been great to hear from and be back in touch with so many people. And how cool is it that every one of these pieces represents one of those people? Pretty amazing really. 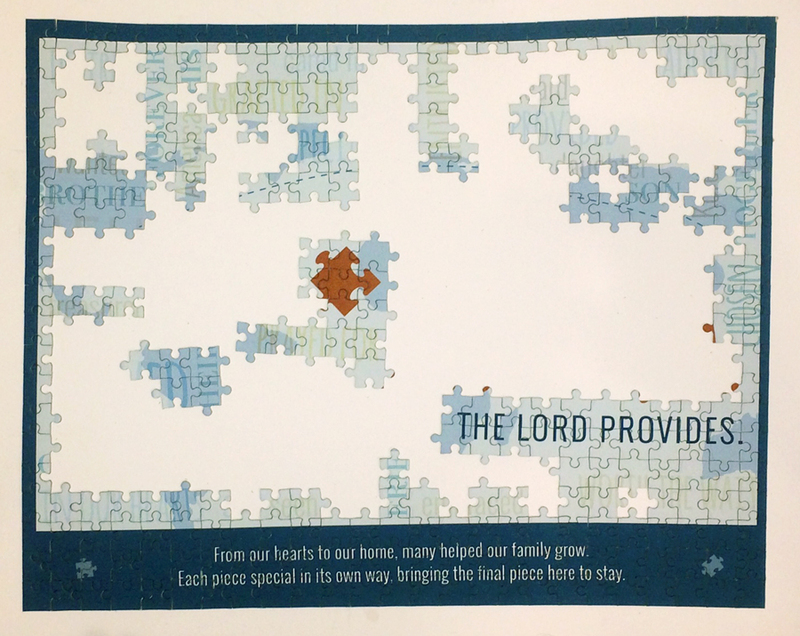 We are now at a little over 27% of the puzzle (139 pieces sold!) Woohoo! Stay tuned for the next update & feel free to share with anyone that may be interested. 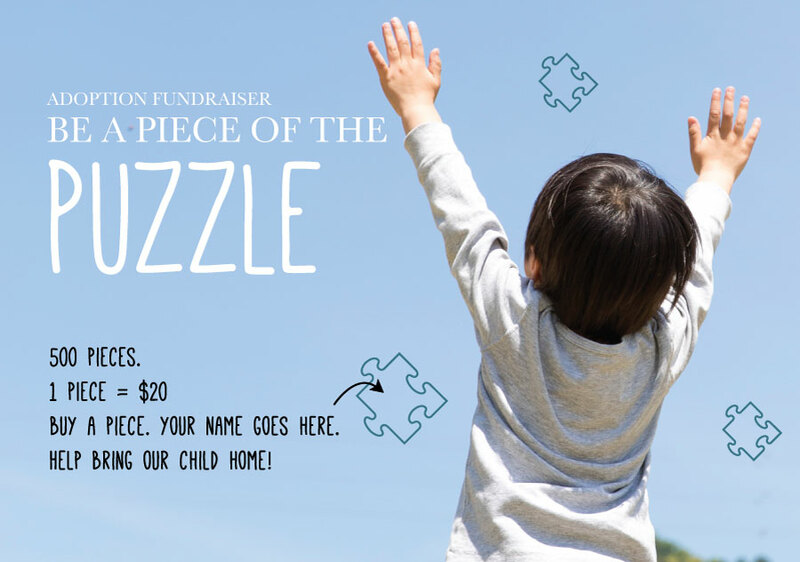 Here it is… This week we are excited to launch our puzzle fundraiser to help raise funds for our adoption from South Korea! In case you haven’t heard, we are in the process of adopting from South Korea! We could really use your prayers and support as we start this new journey. Here’s one way you can be involved. Adoption can be expensive (~$42,000) and it’s humbling to ask people for help. But over the years we’ve seen what a blessing it is to do things in community, in partnership with others. So, if you’ve been a piece of our puzzle, thank you! Now we’re asking that you be a part of our child’s puzzle as well. We are so excited about this fundraiser, because we are creating a picture together. Me and you! 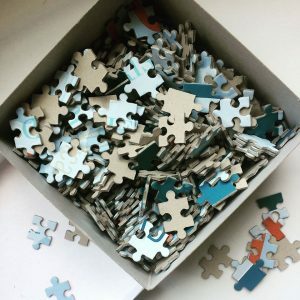 We’ve designed a 500 piece puzzle with the hope that it will not only help raise a significant portion of our funds, but will also be a keepsake that our child can look back on throughout his life and see all the people that played a role in his story. We have designed a really sweet looking 500 piece puzzle. You can “purchase” a piece of the puzzle by donating $20. You can choose to buy one or many. There is no limit! 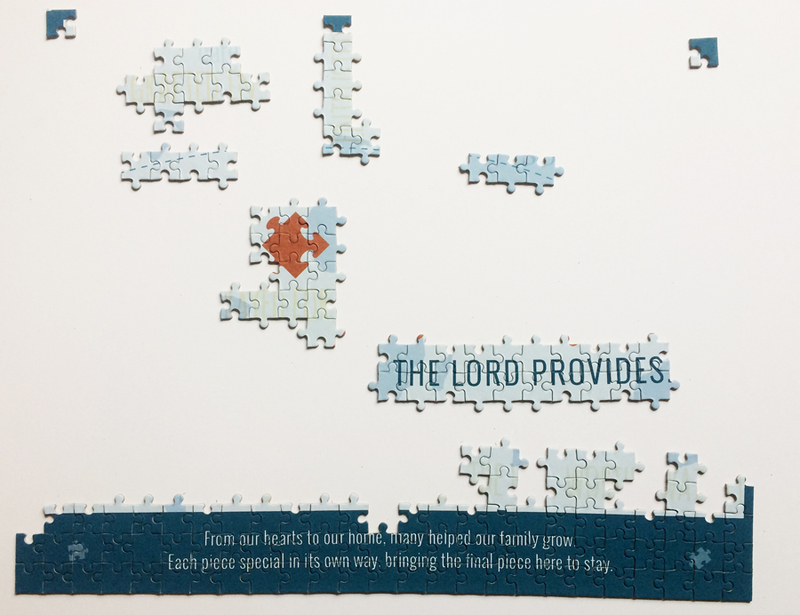 After we get your donation we will write your name on the back of your puzzle piece(s). When every piece is sold, we will put the puzzle together in double-sided glass and hang it in our child’s room. This way he can always look back and see who had a “piece” in bringing him home. Questions? Just ask! Ready, set… Get your piece! We‘ll regularly be updating our blog, jcjunkie.com/adoption, with pics & progress! http://jcjunkie.com/wp-content/uploads/2016/05/puzzle.jpg 295 775 kimmiesue http://jcjunkie.com/wp-content/uploads/2017/02/jcjunkielogo.png kimmiesue2016-05-24 22:05:152017-03-01 17:51:22Puzzle Fundraiser! A year ago on Mother’s Day, Josh and I decided to move forward with adoption. We had always talked about it, but both agreed this was the time. One year in and it’s been quite the journey, and we’ve barely started. We started by emailing everyone we knew who had ever adopted. 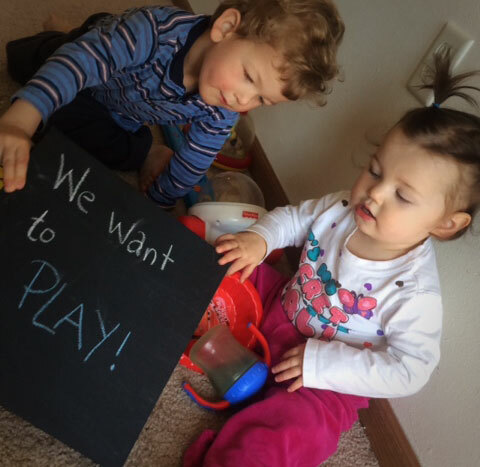 We picked their brains, asked where to start, what to do, and how their journey went. We checked out books, read blogs, and gleaned as much information as we could. Then we started visiting agencies and looking into countries. We visited three in the Madison area, and immediately connected with Claire at LifeLink. We loved her heart for the children and her passion for bringing families together. It was obvious from the start that this was an agency we could really love and work with, but we still weren’t sure about the country. After much prayer and research, we narrowed it down between Kyrgyzstan and South Korea. We’ve always wanted to adopt from Asia, we just weren’t sure where. Which culture could we best embrace? Which one would fit best with our family? How old were the children? Health restrictions? 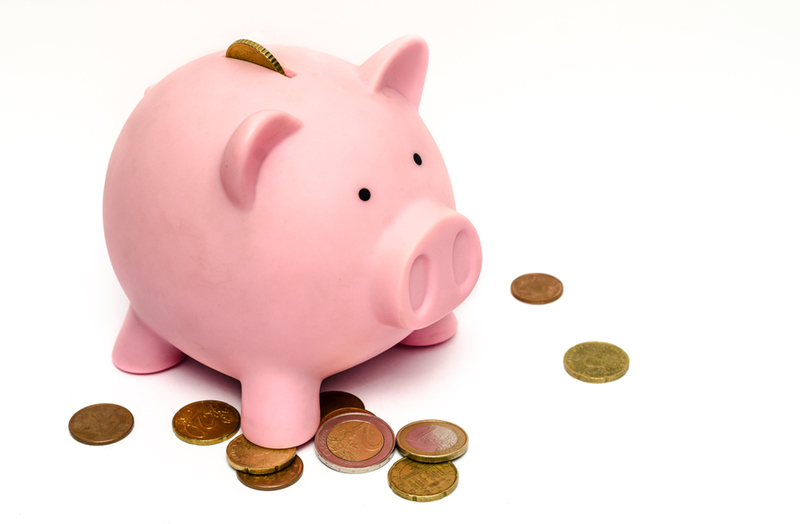 Time and money considerations? Orphanages vs. foster care? Programs, agencies, etc. all were considered. We watched documentaries (and loved them!). We interviewed multiple families that had adopted from both places and from different agencies. Although we had started taking steps toward a Kyrg adoption, things weren’t lining up. Soon, it became obvious to both of us that South Korea and LifeLink were the route we should take. They have an amazing program that has been in place for many years. Children are fostered right from the start, and children tend to be younger at time of placement. 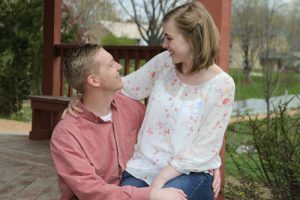 They are ethically sound, Christian-based, and everyone we have met involved with the agency obviously has a heart for loving and helping families to grow through adoption. We have most of our paperwork finished, and just have a bit more training and a couple of home study interviews. After this, we expect to get our referral rather quickly. In fact, the other day we were at a training with Lifelink in Chicago, and they asked us if we wanted to see pictures of the three little Korean boys that are waiting to be adopted. I just started crying and we decided we just can’t do that until we are ready to move forward. I know it will happen soon enough, but some days it can’t come fast enough. I often think of little Jireh and what he is doing. He’s most likely already born, probably about six months younger than Ana (who is currently 15 months). I think about him and wonder if he’s crawling, what he’s eating, how he’s playing, and if he’s being loved on. It’s comforting to know that he’s most likely in a foster home and there are people around him to care about him, but it still breaks my heart to know that he is just waiting. One year in and I know that the journey has only begun. I wonder what life will look like for us and for him in a year from now? What will next Mother’s Day look like? Will we have a photograph? Will we be close to picking him up? Will he already be in our arms? For now we can only pray, wait, and hope. At least I know that he has a Father up above who sees him and cares for him, even if we can’t right now. We were able to hear several stories of others who have adopted. Oh, and did I mention that the skies opened up and provided a beautiful day? Thank you God for perfect weather and provision. And thank you to all those who came out and supported us the last couple weeks. I hope you enjoy your photos as much as we enjoyed shooting them! Want to see more photos from the event? Here are a few more, with permission. One of the strongest statements that you can make against a culture of abortion, or a culture of death, or a culture that uses birth control and says “these kids are just in the way” is to go out of your way to add children to your life. Powerful words from John Piper about adoption. I couldn’t agree more. Kim and I attended our first official adoption training in Chicago this weekend. My aunt was gracious enough to let us stay the weekend with her, and my mom came down to help with the kids, so it was really quite convenient. Thanks for all the help! So what is adoption training anyway? Well, I wasn’t quite sure either, but we are required to have 8 hours of in-person training and 10 hours of online training. So this counted towards our in-person hours. Why all the training? We’re already parents right? Well, I guess there are things specific to adoption that we need to be aware of. Something I didn’t realize but adopted kids are by definition ‘at risk’ because they don’t have parents right away. They don’t have a ‘normal’ childhood. And this can lead to mild to severe developmental problems. Kids need love. Kids need attention. And children in orphanages, or passed between care givers don’t get that. So there are things to be aware of. We spent the morning hearing from a child psychologist. He talked about the basic needs of children, how to tell when they’re at their limit, and what to do to help them cope. Kids don’t have the same learned coping mechanisms that adults have learned, so they often express their frustrations in erratic often explosive ways. It’s important for a parent to help your child learn appropriate ways to express themselves. And sometimes just giving them a squeeze (or proprioception) can do the trick. I appreciated hearing from him. He gave us several things to think about. The afternoon was especially helpful as they brought in a family who adopted from South Koren through our same agency. Talk about relevant! It was so sweet to see their two adopted Korean boys sitting right there in front of me. It almost made cry to see the reality of it. It’s not just paperwork or theory or a picture in a book. There they were! Adoption works, and now they have two loving parents. The father kept imploring us “Adoption is worth every second! It’s a long process and there will be difficulties. But it is so worth it. It’s worth every second!” I think we needed to hear those words, to see those kids there in the room with us, and see that this actually works. Families do come together this way. 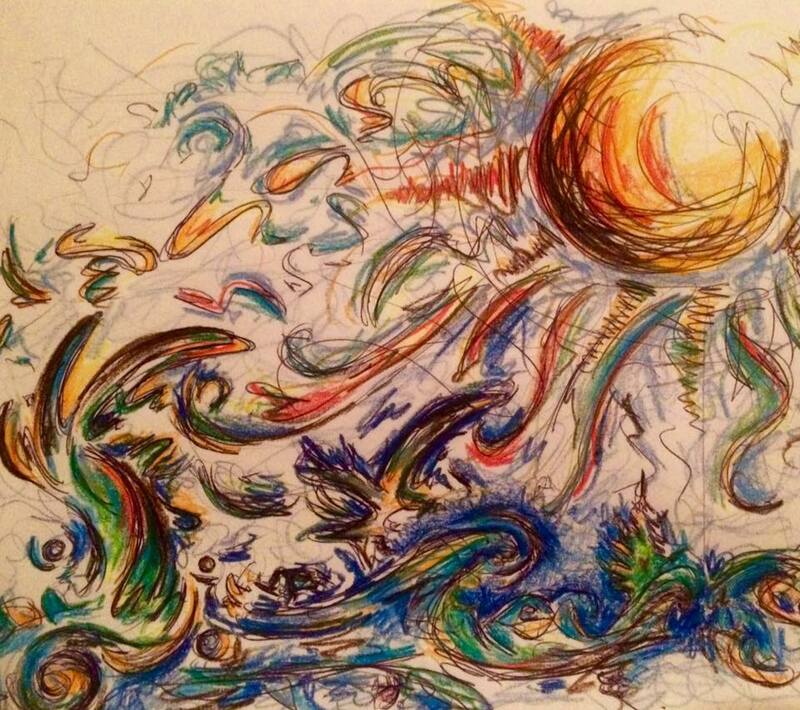 Hearts are blended. Children are loved. What a beautiful picture. And to think that God does this for us just blows me away. We stayed the weekend with Aunt Peg in Chicago. Mom C. was able to road-trip with us as well! Not only was it nice to spend time at our agency’s headquarters and training, but it was added bonus to have some quality time with family. They gave us a few goodies! 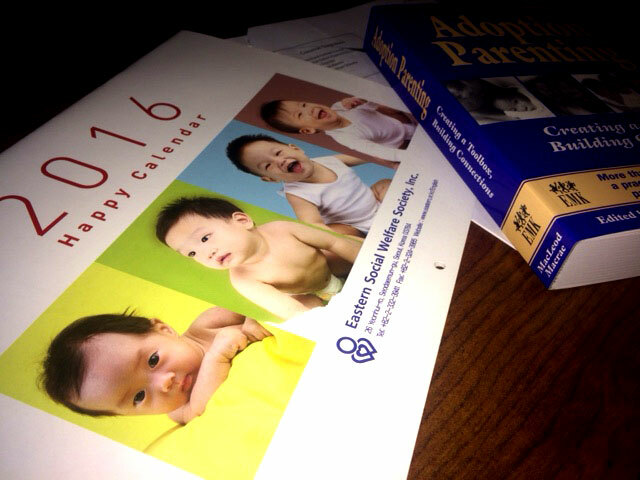 We got a free calendar (filled with sweet pictures of babies from our agency) and an Adoption Parenting toolkit book. Guess what? We have our first adoption fundraiser coming up in a couple weeks! I had fun making these postcards the other day, and thought I’d mostly just post these to get the information out. We will be doing a brief photo shoot at a nearby park to start raising funds for our Homestudy. 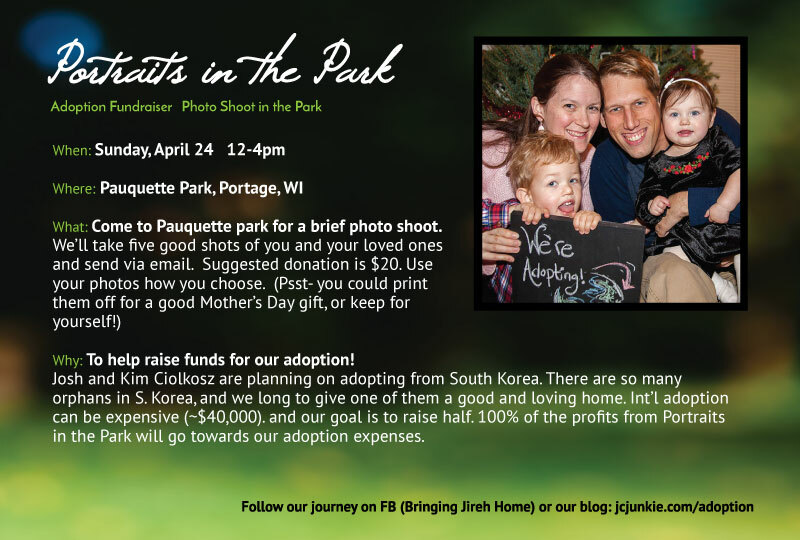 If you happen to live in Wisconsin, we’d love to see you there. 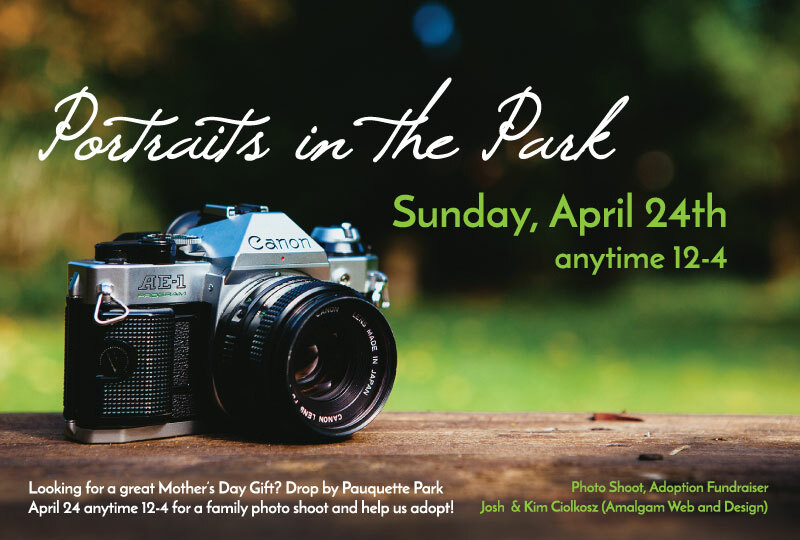 Pauquette is a lovely park, and it’s a great time of year to get some shots for Mother’s Day, as a couple, a single, friends, or whatever. Josh will be taking the photos and I’ll be assisting. For those who don’t know, Josh and I both have a bit of a background in Photography (He has a minor and has taken pictures all over the world, and I spent much time working at a studio/ was an art major). We’ve recently done a decent amount of photography with our web and design business as well. So, we thought this would be a fun opportunity to use our skills, give back to those around, and save a little towards our first phase. Prayer Point: You can just thank God that we feel excited about having a plan of action and moving forward. We can’t wait to involve others in this opportunity and watch how things unfold. Thanks so much for the outpouring of encouragement, love, and prayers! You can be praying for our upcoming training next weekend in the Chicago area. Sneak Peak: Here’s a sneak peak at what’s to come. April 15: We are attending an all day adoption training in Elmhurst, IL (our agency‘s headquarters). Looking forward to meeting the head of the Korean program, learning more about international adoption, and about what lies ahead. People can’t find God for the same reason a thief can’t find a policeman.